When water freezes, it expands. If water seeps into concrete cavities, such as capillaries or pores, and then freezes, that expansion can produce pressure in the concrete. Once the pressure exceeds the tensile strength of the concrete, the cavities will burst. If those areas are small, then it may not be significant at first, but if that cycle is repeated over time through multiple events of water seepage, freezing and thawing, then significant cracking, scaling and crumbling of the concrete can occur. This phenomenon is important not only after the concrete is in place and cured but also during its placement. The common approach to improve the resistance of concrete against freezing is the use of intentionally entrained air. This creates more air voids in the concrete, which act as empty chambers for the freezing and migrating water to enter and expand into, thus relieving the pressure in the capillaries and pores and preventing damage to the concrete. A better solution is to create concrete with low permeability in the first place, which is better able to resist the penetration of water and, as a result, be less affected by freeze-thaw cycles. A related freeze-thaw issue comes about when aggregates are used that can absorb water. If those aggregates reach critical saturation, they cannot accommodate the expansion and hydraulic pressure that occurs when water inside the aggregate freezes. The result is expansion of the aggregate and possible disintegration of the concrete. If this occurs near the surface of the concrete, it can cause a pop-out of a section of concrete and aggregate. As concrete cures, it changes slightly in volume, typically shrinking, but, in some cases, it can expand. The most common reasons for this change in volume comes from changes in moisture content or in temperature. If the concrete is restrained against volume changes, especially contraction, then the internal forces can cause cracking to occur. For example, since almost all concrete is mixed with more water than is needed to hydrate the cement, much of the remaining water evaporates. The surface of freshly placed concrete can be prone to shrinking if water evaporates faster than it is replaced by other water. Due to the restraint provided by the concrete below the drying surface layer, tensile stresses develop resulting in shallow cracks of varying depth. The common remedy is to prevent rapid water loss from the concrete surface by using fog nozzles, plastic sheeting, windbreaks and sunshades to prevent excessive evaporation. Similarly, evaporation can reduce the volume of the curing concrete below the surface too, causing it to shrink as the concrete dries. Restraint to this shrinkage, from the subgrade, steel reinforcement or another part of the structure, creates tensile stresses in the hardened concrete. These stresses can lead to cracks of all sizes. In many applications, this drying shrinkage cracking is considered inevitable, which is why control joints are used to predetermine their location. Drying shrinkage can be limited by keeping the water content of concrete as low as possible and maximizing the coarse aggregate content. Finally, cracking can occur in concrete due to thermal expansion when heated and contraction when cooled. Thermal expansion and contraction of concrete varies with factors such as aggregate type, cement content, water-cement ratio, temperature range, concrete age and relative humidity. Of these, aggregate type has the greatest influence. Designers should give special consideration to structures in which some portions of the structure are exposed to temperature changes, while other portions are partially or completely protected. Allowing for movement by using properly designed expansion or isolation joints and correct detailing will help minimize the effects of temperature variations. Concrete is subject to chemical attack whenever it is used in conditions that create compounds that can interact with the chemicals of concrete. Concrete is rarely, if ever, attacked by solid, dry chemicals. To produce a significant attack on concrete, aggressive chemicals must be in solution and above minimum concentration levels. Acids, for example, occur in liquid form and can react with the calcium hydroxide of hydrated portland cement. Sulfuric acid can form in the atmosphere from the mixture of sulfurous gases and water (acid rain) from the burning of fossil fuels and become a problem for concrete. 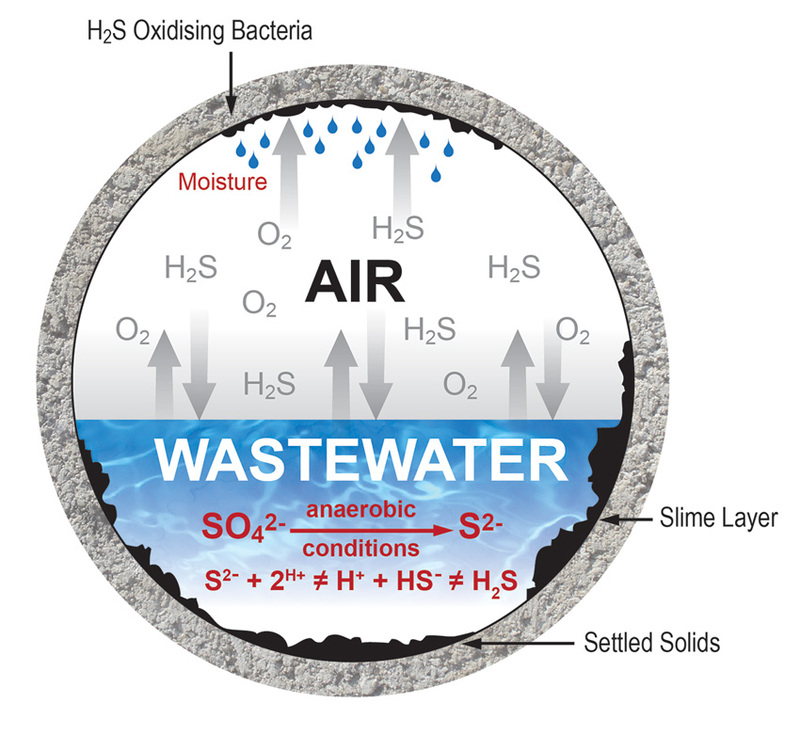 Similarly, certain bacteria convert sewage into sulfuric acid, which is particularly aggressive to concrete because it reacts with portland cement to form calcium sulfate, which deteriorates concrete. Sulfates attack concrete by reacting with hydrated compounds in the hardened cement. These reactions can induce sufficient pressure to disrupt the cement paste, resulting in loss of cohesion and loss of strength. Naturally occurring sulfates of sodium, potassium, calcium or magnesium in soil or groundwater can also cause sulfate attack on concrete. When water laden with these chemical compounds evaporates, sulfates can be left behind to accumulate on the concrete surface, increasing in concentration and their potential for causing deterioration. Seawater also contains sulfates but is not as severe an exposure as sulfates in groundwater. Of course, environmental conditions have a great influence on sulfate attack, with the greatest concerns present when concrete is exposed to wet/dry cycling. To prevent deterioration from acid attack, portland cement concrete generally must be protected from acidic environments either with surface protective treatments or by selecting concrete mixes that are somewhat acid resistant. Resistance to sulfates in concrete is typically achieved by using a low water-to-cement ratio and a cement with a limited amount of tricalcium aluminates. Calcium chloride reduces sulfate resistance so it should not be used as an accelerating admixture in concrete exposed to severe sulfate environments. However, since liquid penetration is the issue, creating concrete with less permeability can also produce less deterioration from acid or sulfate attacks. Salts and alkalis can also be problematic for concrete. Specifically, the chloride and nitrate salts of ammonium, magnesium, aluminum and iron all cause concrete deterioration. Ammonium salts are the most destructive because, in the alkaline environment of concrete, they release ammonia gas and hydrogen ions. These are replaced by dissolving calcium hydroxide from the concrete. The result is a leaching action, much like acid attack. Salts suspended in water can also crystallize in porous concrete and cause weathering damage, particularly in the form of sodium carbonate and sodium sulfate. Under drying conditions, salt solutions can rise to the surface by capillary action and, as a result of surface evaporation, the solution phase becomes supersaturated and salt crystallization occurs, sometimes generating pressures large enough to cause cracking and scaling. Alkalis can be an issue with some aggregates too. In most concrete, aggregates are more or less chemically inert, but some react with the alkali hydroxides in concrete, creating alkali aggregate reactions (AAR). Those reactions can cause expansion and cracking over a period of years. The most typical of these is an alkali-silica reaction because aggregates containing reactive silica materials are more common. Aggregates containing certain forms of silica will react with alkali hydroxide in concrete to form a gel that swells as it draws water from the surrounding cement paste or the environment. In absorbing water, these gels can swell and induce enough expansive pressure to damage concrete. Typical indicators of alkali-silica reactivity are map (random pattern) cracking and, in advanced cases, closed joints and spalled concrete surfaces. Because sufficient moisture is needed to promote destructive expansion, alkali-silica reactivity can be significantly reduced by keeping the concrete as dry as possible. In fact, the reactivity can be virtually stopped if the internal relative humidity of the concrete is kept below 80%. Chloride ions that penetrate concrete and cause reinforcing steel to oxidize or rust can lead to significant deterioration of the concrete as the steel expands and creates stress on the concrete. Corrosion of reinforcing steel and other embedded metals is the leading cause of deterioration in concrete. The corrosion occurs when the iron that is integral to steel reacts with oxygen to create iron oxide, or rust. If this happens inside concrete, the corroding rust expands to occupy a greater volume than the steel. This expansion creates tensile stresses in the concrete, which can eventually cause cracking, delamination and spalling. Exposure of reinforced concrete to chloride ions, commonly found in deicing salts and seawater, is the primary cause of premature corrosion of steel reinforcement. No other contaminant is documented as extensively in the literature as a cause of corrosion of metals in concrete. 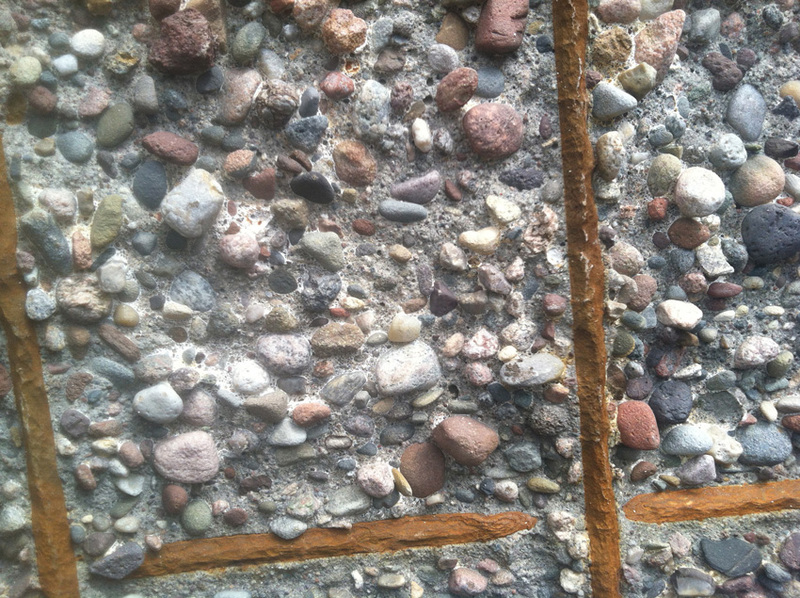 Chlorides dissolved in water can permeate through concrete pores or reach the steel through cracks. Chloride-containing admixtures can also cause corrosion. The risk of corrosion increases directly as the chloride content of concrete increases. However, only water-soluble chlorides promote corrosion; some acid-soluble chlorides may be bound within aggregates and, therefore, are unavailable to promote corrosion. The primary factors are the availability of oxygen, the pH level, the temperature and the relative humidity of the concrete. Corrosion of embedded metals in concrete can be greatly reduced by first providing an adequate thickness of concrete cover over the reinforcing steel. An even stronger defense involves creating low-permeability concrete to reduce the likelihood of water containing chloride ions from ever reaching the steel to begin with. Eliminating or filling cracks is part of assuring low permeability. Another source of steel corrosion can also deteriorate the surface of the concrete first. Carbon monoxide (CO) and carbon dioxide (CO2) in the atmosphere are the gasses responsible for the corrosive phenomenon known as ‘carbonation.’ This is a process that creates a corrosive condition that softens the surface layers of the concrete. It occurs when carbon dioxide from the air penetrates the concrete and reacts with hydroxides, such as calcium hydroxide, to form carbonates, specifically calcium carbonate. This reaction reduces the pH of the concrete and in turn directly affects the ability of the concrete to protect steel reinforcing in part because carbonation of concrete lowers the amount of chloride ions needed to promote corrosion. In new concrete with a pH of 12 to 13, about 7,000 to 8,000 ppm of chlorides are required to start corrosion of embedded steel. If, however, the pH is lowered to a range of 10 to 11, then the chloride threshold for corrosion is significantly lower—at or below 100 ppm or less than 1.5% of what would be required otherwise. Carbonation is generally a slow process, but the amount of carbonation is significantly increased in concrete with a high water-to-cement ratio, low cement content, short curing period, low strength and highly permeable or porous paste. Further, carbonation is highly dependent on the relative humidity of the concrete. The highest rates of carbonation occur when the relative humidity is maintained between 50% and 75%, while below 25% relative humidity, the degree of carbonation is considered insignificant. Hence it makes sense that carbonation-induced corrosion often occurs in humid locations, such as areas of building facades that are exposed to rainfall or shaded from sunlight. Reducing the permeability of the concrete will again help combat the reactions needed for carbonation to occur.